Ackermann’s Repository was a publication dedicated to, according to its title, the Arts, Literature, Commerce, Manufactures, Fashions and Politics. In 1818 there appeared in its pages a letter from a reader concerning the path to a happy marriage (entitled, Rules and Maxims for Matrimonial Happiness). Its contents could initially be supposed, by a person – like myself – distant to the time period, to be an adequate reflection of the ideals of marriage in the early nineteenth century, however a reply in the next issue of the journal leads me to suppose that this man’s conservative opinion was truly conservative. She criticises the creator of ‘Rules and Maxims’, wondering how his married life could have been so miserable when he has been in possession of such rules that he claims could have improved the happiness of any who would follow them. She does acknowledge that women do promise “to love, cherish and to obey” when they repeat after the clergyman their Anglican marriage vows, but she points out that the writer seems to have forgotten his own part in the ceremony, that is, his pledge to “love and to cherish”. I found it rather funny to hear her relate the manner in which women found their own type of “power” in this type of marriage. You know, Mr Editor, or at least if you are a married man you ought to know, that in most families the nominal supremacy is vested in the husband, but the real power is in the hands of the wife; that is to say, she is contented to let her husband appear to rule, provided she rules him. It was also interesting to hear her admit that it is not an ideal way for women to have power, but that a husband’s authority should hold sway. However, she does follow with an important point about the rights of women to self-govern their behaviour. Now I am willing to admit, that this is wrong on the part of the wife, for in certain points I think the husband’s authority ought to be undisputed; but I should like to know, has the wife no rights of her own to defend? 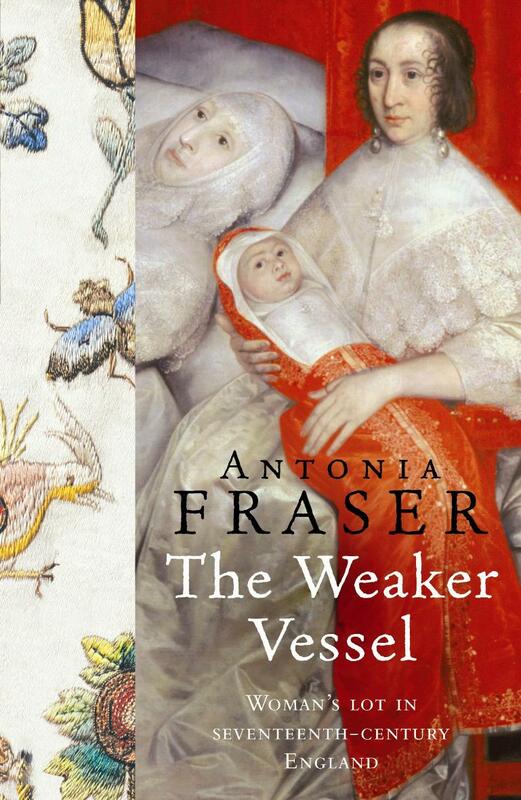 Are her time, her occupations, even her amusements, to be at the mercy of an arbitrary master – who will undervalue her talents, be a spy upon her conduct, and refuse her even the liberty of reading such authors as she may prefer; for what else can be meant by the twelfth, thirteenth, and fourteenth articles? Husbands might benefit from their own advice! She goes on to express her desire that men should also read the sermons of “the fathers of the church” in order to provide themselves with instruction, which is not all that unreasonable. It is unfortunate that, while men have told women for centuries that they should obey their husbands (which it never actually says in the Bible, though it does say “submit”), the sentence where St Paul declares that husbands should love their wives as Christ loves the church and gave Himself for her, is less often quoted (Ephesians 5:25). I am sure that if all women were loved like this, they would have had a lot less trouble obeying! I find that more light is shed on the actual state of marriage in the Regency period when this lady states, “I have no objection to make to those [rules] which he has added for the use of wives: on the contrary, I think that the observance of them would essentially promote matrimonial happiness.” These rules, which are reprinted in full in my former post, cluster around issues of respect for the husband and, whilst they are still quite conservative, they may merely be the way in which Regency wives demonstrated their love and respect for their husbands. Sophia Sticklefort’s main contention seems to be with this man’s view of the manner in which a husband should deal with his wife. The author of ‘Rules and Maxims’ seems to represent the view that no reciprocal love or respect from the husband to the wife is necessary in a marriage, which is clearly (in my mind, and even in a Regency woman’s mind) not conducive to marital happiness! In her conclusion, she quotes a poem by Matthew Prior (1664-1721) and suggests that any such rules for connubial felicity need to be set on “a different principle”; in short, a principle of love, forgiveness, and gentleness. What good advice! Whilst the beginning of the nineteenth century was a time where women did not have most (or any) of the same rights as men, there was still the prevailing opinion – according to contemporary sources – that men and women were equal (if not in the sight of the law, in the sight of God at least!). In addition, the prevailing opinion was changing as to the acceptable reasons for marrying. The decision of whom to marry, whilst still a financial decision, was changing so that love and affection could also form part of the choice. 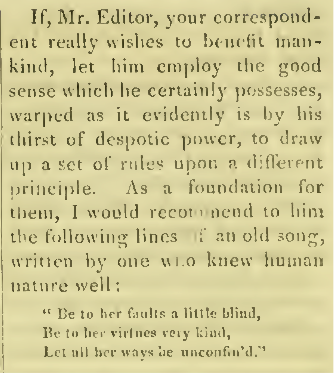 Jane Austen, in her letters to her niece (1814), encouraged her to choose a husband for whom she felt affection. Nothing can be compared to the misery of being bound without love. Jane still maintained the importance of marrying someone who had the means to live, but equal to that was her conviction that love was something to be desired in a marriage. I find it reassuring that, regardless of the state of women’s rights in the nineteenth century, it did seem to be recognised that in order to have a happy marriage both parties needed to love and respect each other! Good advice in any century! Ackermann’s Repository of Arts, Literature, Commerce, Manufactures, Fashions and Politics (1818) – This letter was printed on page 86-87. The benefits of marriage have been long understood, and were even pronounced solemnly during the wedding service! However, despite such a long and glorious tradition, one continues to wonder at the key to a happy marriage! Unfortunately, it is not just in the modern era that we wonder such things. They also did in 1818, with one reader of Ackermann’s Repository (1818) composing a rather extensive set of directives “for producing connubial felicity” for the betterment of his fellow man. The Editor, in accepting this letter for publication, acknowledged that the author of it had also related his tales of woe concerning his own marriage and the misery that it had caused him. Undoubtedly, you will not find it hard to imagine him in misery upon reading his advice to husbands and wives. When courting your mistress [future wife], never miscall her by the name of angel or goddess, lest she mistake it for truth, and forget that she is mortal and a woman. 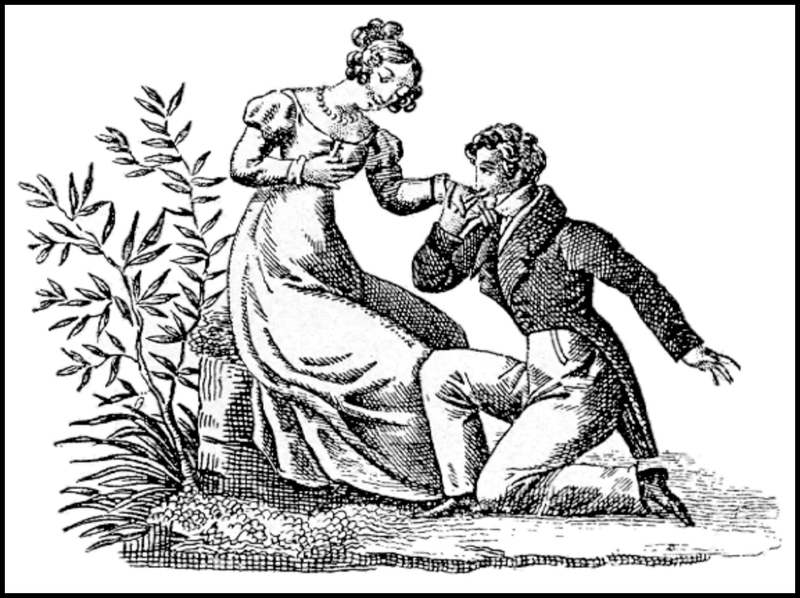 When putting the question (as it is termed), be careful not to allow her to suppose that your happiness, or even comfort, depends on her assent: recollect that you are making a proposal, not begging a boon. Teach her beforehand, that the marriage ceremony is not a mere matter of form, and explain fully the meaning of the word obey. Be careful. at church, that she repeats every word distinctly after the clergyman, that she may afterwards have no excuse for acting in opposition. When you take her home, tell her that she is to command your servants, but that you are to command her. On placing in her hands the household sceptre, make her understand, that she is only a tributary sovereign, and that you are her liege lord. Be not imperious, but decided, and always speak as if it were a matter of course to be obeyed. Be not backward to blame, lest she attribute it to fear: if once she knows that you are afraid of her, your authority is at an end, and you become a poor, degraded, dependant, miserable creature. If pleasure or business take you from home, expect cheerful looks on your return; the surest way to secure them is to give them: a wife, like the moon, should shine by reflection, and her brightness should arise from the glory of her husband. Be sure, however, to guard against the variableness of your moon, and allow no one to eclipse her in your eyes. If she be of an obstinate or sulky temper, do not proceed to extremities, lest you fail, but shew he that you do not mind it: treat her as if you did not perceive it, and her own mortification will be her cure. If she be passionate and violent, be you cool and collected in proportion: if she irritates you, she has mounted one step of her throne and you descended one step of yours. Treat her as the mistress of your family before the servants, owning you only as her superior and lord paramount. If she be fond of reading (which itself is a misfortune, and to be discouraged), let her have no novels: if she must read, give her the memoirs of Roman wives and matrons: if she prefer light reading, put before her the words of the fathers of the church. Be careful that she do not think too well of herself in point of learning, lest she soon fancy herself superior. If she be witty, teach her that the best mode of shewing it is to conceal it. If you take her to places of public amusement, make her know that it is the reward of, and not a bribe to, good conduct. Let her be as little as possible along: if a man, according to the philosopher, is not to be trusted by himself, ought we to have more confidence in a woman? Finally, love her, but do not shew it too much, lest she take advantage of it: as all wives desire power, it should be the business of all husbands to prevent their obtaining it. But wait! There’s more! This gentleman also furnished the Editor with a second set of maxims to which wives should adhere to. When a young gentleman makes you an offer, hold yourself flattered by his preference, and be proportionately grateful. If you accept him (which we will suppose of course), study his temper and inclinations, that you may better accommodate your own to them. After marriage obey him cheerfully, even though you think him in error: it is better that he should do wrong in what he commands, than that you should do wrong in objecting to it. If he flatters you, do not forget that it is but flattery: think lowly of yourself and highly of him, or at least make him believe so. If you see any imperfections in your husband (which there may be), do not pride yourself of your penetration in discovering them, but on your forbearance in not pointing them out: strive shew no superiority, but in good temper. Bear in mind continually, that you are weak and dependant; and even if you are beautiful, that it adds to your weakness and dependance. If you displease him, be the first to conciliate and to mend: there is no degradation in seeking peace, or in shewing that you love your husband better than your triumph. If misfortunes assail you, remember that you ought to sustain you share of the burden: imitate your husband’s fortitude, or shew your own for his imitation. When you rise in the morning, resolve to be cheerful for the day: let your smiles dispel his frowns. Take pride in concealing your husband’s infirmities from others, rather than in proclaiming them: you will only be laughed at by all your acquaintances if you tell his faults to one. Endeavour rather to save than to spend your husband’s money: if his fortune be large, strive to preserve it; if small, to increase it. Be not importunate or obtrusive in your fondness, and choose proper occasions for your caresses, lest they prove wearisome. Finally, recollect always that God has made yon subject to him, and that he is your natural guardian and protector; that you owe your husband not less honour than love, and not less love than obedience. Now, it needs to be said that this view of matrimony, even in 1818, was a little conservative. Even James Forsythe, an Anglican clergyman, was not so conservative when he wrote his Sermons to Young Women (1766) and his Addresses to Young Men (1777). 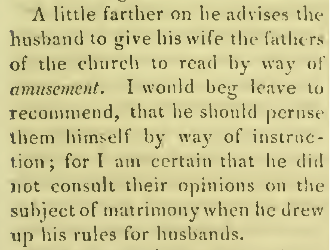 Jane Austen (1775-1817), whose father was a devout clergyman (as was two of her brothers) and was herself also considered to be very religious, would hardly have condoned this view of matrimony. The Austen family (both women and men) certainly ALL read novels! This article was also written considerably before the stricter Victorian ideals about female behaviour had entered English society. This leads me to consider that this gentleman occupies the conservative side of the debate in his day. It also makes me wonder what sort of woman he married! I have written a subsequent post about the response the Editor received in the next issue of Ackermann’s Repository, after the publication of this advice. Ackermann’s Repository of Arts, Literature, Commerce, Manufactures, Fashions and Politics (1818) – this letter was printed on page 29-32. A Living Wife or a Dead One? What would you do if you found out your beloved was dead? Here’s another funny chronicle in my readings of Joe Miller’s Jests (1740)! Hmm… I wonder how many Men would agree with that!